Peaksports.com is the brainchild of Dr. Patrick Cohn, owner of Peak Performance Sports, LLC. In 1996, considering the success of his company, it was only natural for Dr. Cohn to take it a step further with his related website, Peaksports.com. Peak Performance Sports’ website is dedicated to helping athletes, coaches, sports parents, and mental coaches understand and learn practical mental training strategies. At Peak Performance Sports, you can discover the secrets to thinking like a champion, so that you can perform like one. Dr. Cohn’s mental training programs for athletes and young athletes will help you or your athletes overcome sports anxiety and deal with competition stress so that you can always perform at your highest level. If you’re involved in a team sport, his online mental training programs and mental toughness seminars for teams or groups will give all your team members the tools they need to be consistently at the top of their game. You can find proven strategies for success in specific sports for all athletes at Peak Performance Sports. Have a problem with confidence and focus? Break through those barriers quickly with The Confident Athlete CD series. Are there young athletes in your family who are struggling with the pressures of competitive sports? Help them improve their mental game with The Confident Sports Kid CD series, especially written for kids and their parents or coaches. With our mental training programs for young athletes and their parents, you can make winning a family affair. In addition to helping athletes be successful, Dr. Patrick Cohn also has a program to train others to coach athletes toward success. 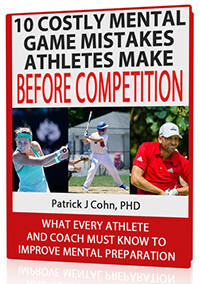 Mental game experts who would like to get one-on-one training from a master mental game coach can enroll in Dr. Cohn’s MGCP certification program for Mental Game Coaches. With proper training, success isn’t a goal, it’s an attitude! Peak Performance Sports can help you improve performance from overcoming slumps to performing more consistently in competition. Dr. Cohn was an athlete, coach, and today a leading sports psychology coach. He started Peak Performance Consultants in 1993 in Naples, Florida. After one year, Dr. Cohn moved to Orlando, Florida can changed the name of his company to Peak Performance Sports to focus on helping athletes and teams reach peak performance. In 1996, Dr. Cohn started Peaksports.com and developed on the first websites devoted to mental training and peak performance in sports. Over the last 20 years, the Peaksports.com has transformed into an online leader in the field with several sports psychology CD programs, mental coaching programs, and mental training seminars. Contact Peak Performance Sports today for more details about products and programs to enhance your mental toughness.